As soon as we found out we were expecting, this past February, I made a painting to help announce the coming of our little one. I love to craft and make paintings and thought it was perfect to make this special painting to let all know. I made this in March, and we sent a picture of this to parents and siblings on April 1st to let them know what's going on! April 1st was Marshall's idea, as I thought it was kind of crude knowing how others (including us, in past years) feel about "announcements" on that day- except ours was real, and that was just the timing of it all. Otherwise I never would have let that happen! Anyway, At that time we were around 10 weeks, I believe, so for a short time just immediate family and close friends here knew. 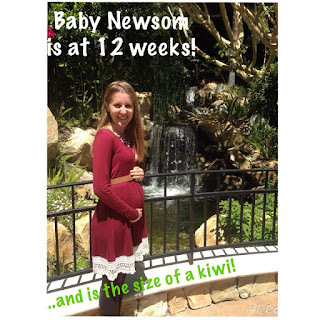 I wanted to wait until 12 weeks, the start of the second trimester, to tell everyone else- so that we did. It was kind of hard to keep it in for a while and sometimes we each let it slip, but it mostly worked! 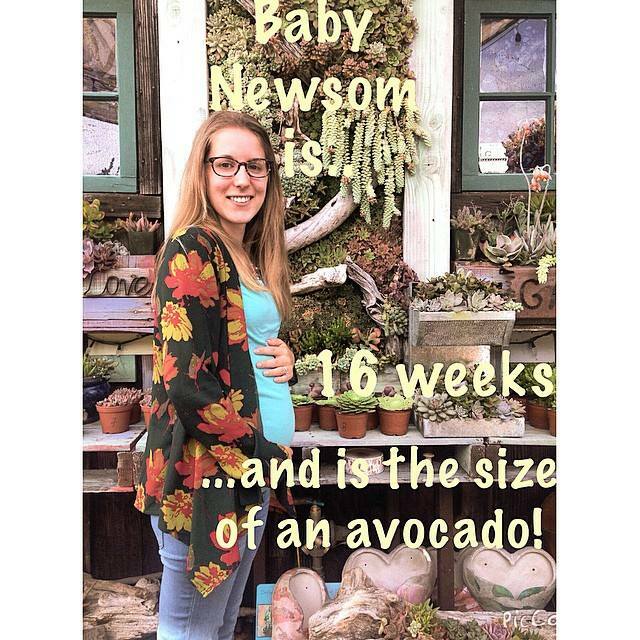 The 12 week photo was taken at the Grand Tradition Estates & Gardens in Fallbrook- it is absolutely BEAUTIFUL and I went there for brunch with a group of other military spouses- fun morning out. This was mid-April. I wanted to take bump photos every other week so as not to overwhelm my instagram feed or whatnot, and also because I like even numbers- not really a fan of odd numbers. No matter how often you take bump pics, you can see a progression and growth of the little one, but I liked how with every other week the changes were a bit more noticeable. Day to day it doesn't seem to change much until you start to pop around 20 weeks. It just depends on the day (bloat/changes) and how baby is sitting in there. This photo was actually taken around 15 weeks, but since I like even numbers, I put 14+. This is also when I received a call from the doctor's office and they changed my due date (again) and finally scheduled the next appointment. I was waiting for some time on that! Here in California, desert plants really do well. (Even being by the coast!) All you see around here are palm trees and succulents. So I went to the local Succulent Café for the next photo at 16 weeks. I keep thinking after the fact that my jacket gets in the way of a photo, but it still works. 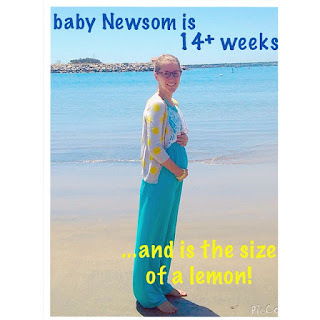 In this photo Little Newsom was about 4 months along. 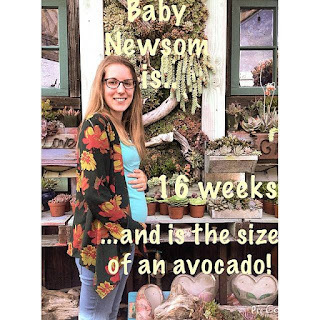 We love avocados around here, so that was my favorite size comparison that time! At 17 weeks we had our first big doctor appointment down at Balboa, and thankfully Marshall was able to get part of the day off the trek down there with me to see our baby. It was the time of the full anatomy scan, so we saw baby from every angle and every nook you can imagine- they checked measurements on every little organ and body part there is. 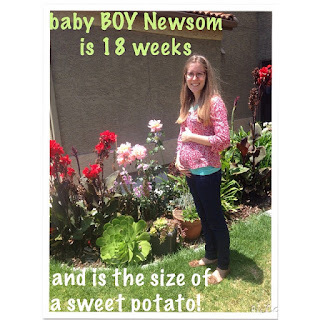 With this, they gave us a more accurate due date - October 28 - and were able to tell us his gender by that point. (And he is healthy & growing well!!) 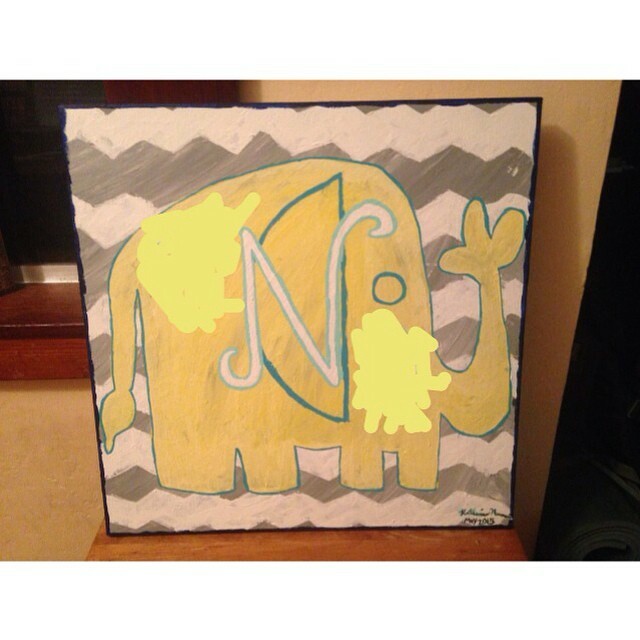 As you can see in the above photo, by this point we knew his name (even though we didn't get the full boy/girl from a doctor yet) and I went ahead and made him a monogram painting. If you saw my post the other day- we just knew. Or really, I just knew. We are having a boy. 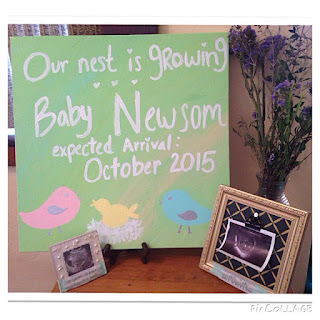 As soon as we found out we were expecting, I just knew. There was such a feeling of peace when thinking about having a boy, especially in knowing his name since we were dating (yes, over 4 years ago). No other option! So... as you can see in the next photo, we are clearly having a boy! The next bump picture was 18 weeks. At the doctor we were able to see little man in 4D (so much detail!!! What a blessing technology is! 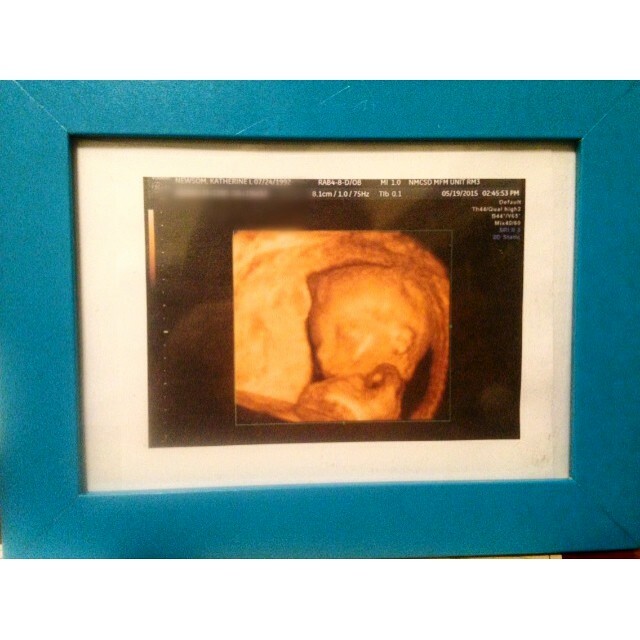 ), and I framed the best photo we have of his little Newsom face and forehead, put it in a blue frame, and posted that on my personal FB/sent it to family, to let all know we were having a little boy. So exciting! 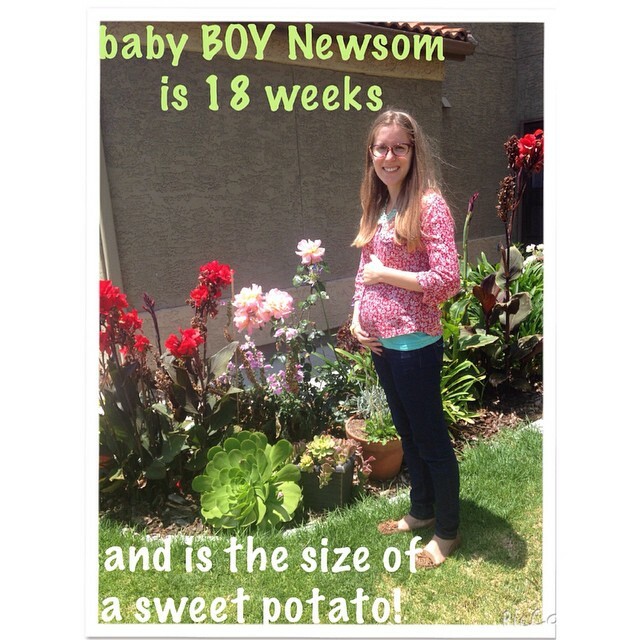 Also- based on the pictures, he is going to be Marshall's mini-me! 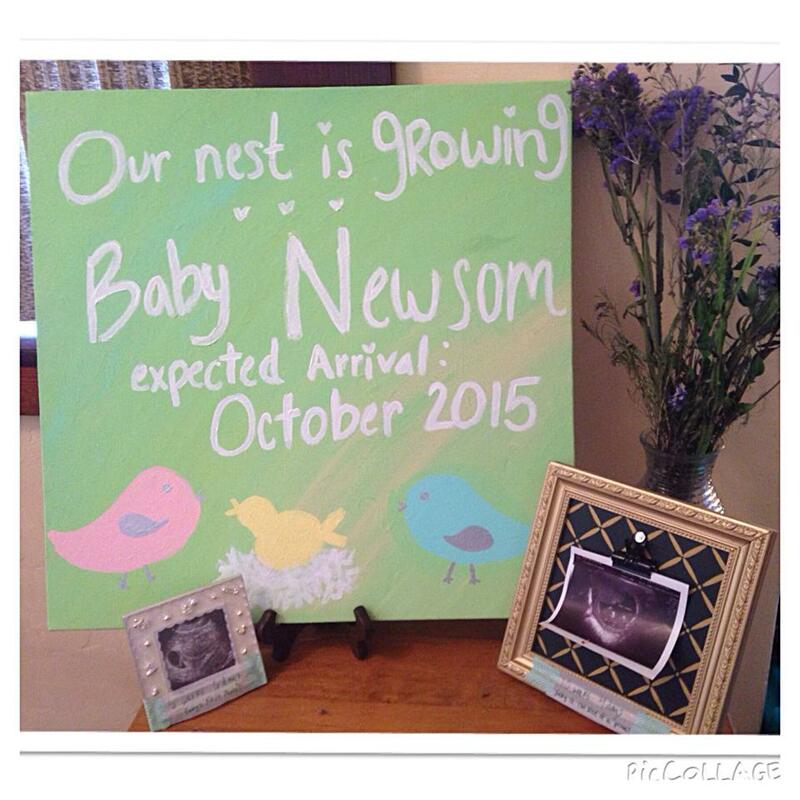 We can't wait to meet him and see his face for the first time! I missed the 20 week photo-even though it's the halfway mark; I was starting to feel like every other week was getting a bit too... overwhelming.. with all the photos. 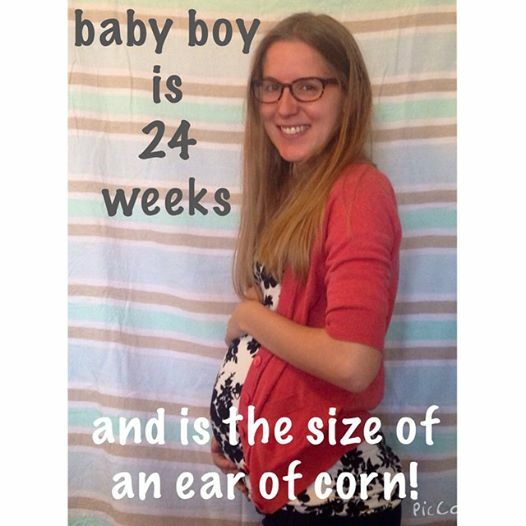 And with having two photo updates at 18 weeks, I just went ahead and called it a day, and skipped a photo for the 20 week mark. There wasn't too much of a difference, I thought, but in reality- there was! My friend Erin took the 22 week photo (actually she's taken almost all of them) in front of a pretty canvas at her house. 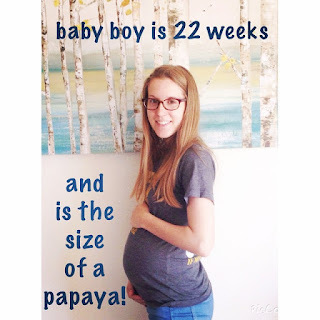 Our little man was the size of a papaya, or a spaghetti squash-depending on if you prefer a fruit or veggie comparison, I think! At this point I was starting to "pop" to some extent, and it was much easier to notice the baby in the belly, if you were a passerby and didn't know previously, perhaps. And today is the day--- on this day, July 8th, 2015, we are currently at 24 weeks, or 6 months, with our little man. This photo was from just a couple hours ago. You can really start to see that a baby is in there! By this point, if someone didn't know, they soon heard from the grapevine or figured it out when they saw us out and about! I feel like baby was showing most of the time, but in reality it's not until you hit about the halfway mark that baby is noticeable consistently. I can see why some wait that long to announce now! Especially if you are away from family and all. But we are glad we did things the way we did. So that's weeks 12-24 of preganancy so far with little Newsom... or months 3-6. It is all SO exciting!!! Since we are leaving here fairly soon, I am almost done with doctor's appointments (at least in San Diego). I only have 2 left! This seems a little crazy to me- I've been having anywhere from 2-5 doctor's appointments a month since about March because of this little one (mostly)... It will be an interesting change of pace. Lots to do- new town, new house, new doctors, new jobs- settling into a new little life past the military. We are both very excited and ready for it all to happen, as overwhelming as it may be, and I'm glad that Marshall was able to have these past 3.5 years in service and fulfill one of his life goals. And at that, we are both ready to move on- so now, on to the next adventure! We are overjoyed to meet our little man in October!!! 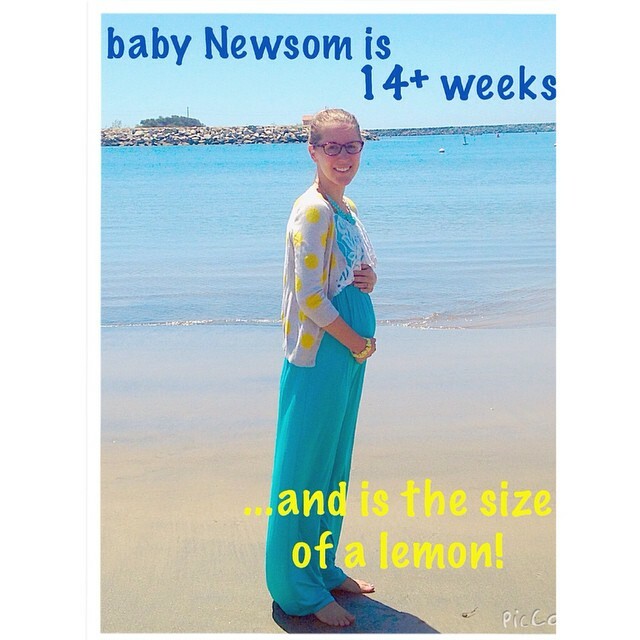 Wow, Baby Newsom sure is growing!